My wife, Shae, lived in Chicago in her early twenties, and we recently made a trip back to visit some of her old friends. It was a classic tale of cold hands, warm hearts. Chicago in the winter doesn’t mess around, but we layered up and surrounded ourselves with friendly faces. I haven’t been to Chicago since my age was a single digit, so I was thrilled to experience the city wearing big person pants. Highlights included an architecture tour and riding the Red Line from north to south to get a better sense for how the city’s neighborhoods fit together. And you know we got all touristy with that deep dish pizza (more on my love of pizza and wine here). When we returned to Seattle, I wanted to find a meal that had all that deep dish comfort and deliciousness without that deep dish bulk. Say hello to vegan potato leek soup. 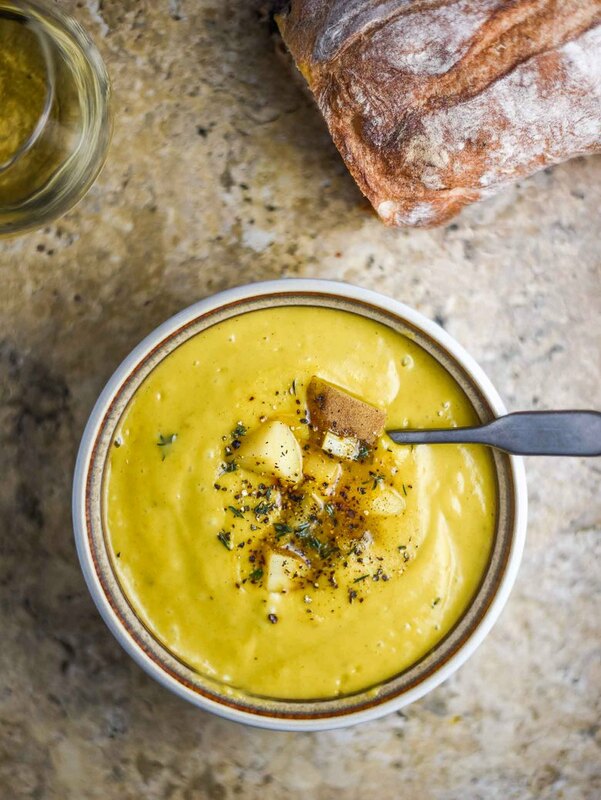 how do I make vegan potato leek soup? 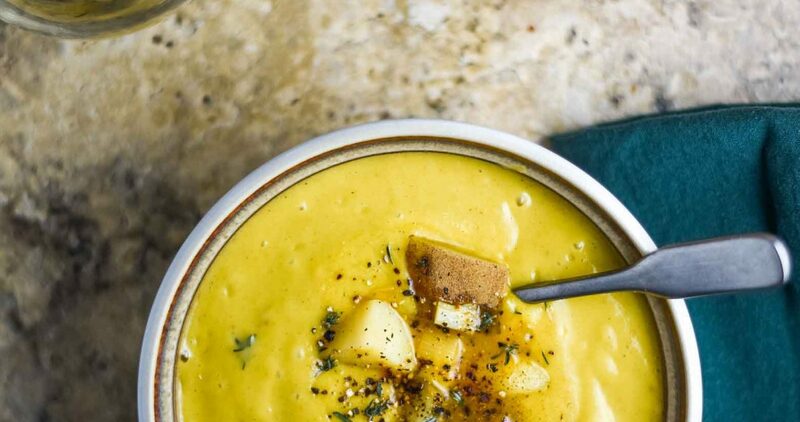 This vegan potato leek soup is extra creamy and dairy-free thanks to the perpetual wonder of coconut milk. And, fortunately for everyone, it’s as easy to make as it easy creamy to eat. 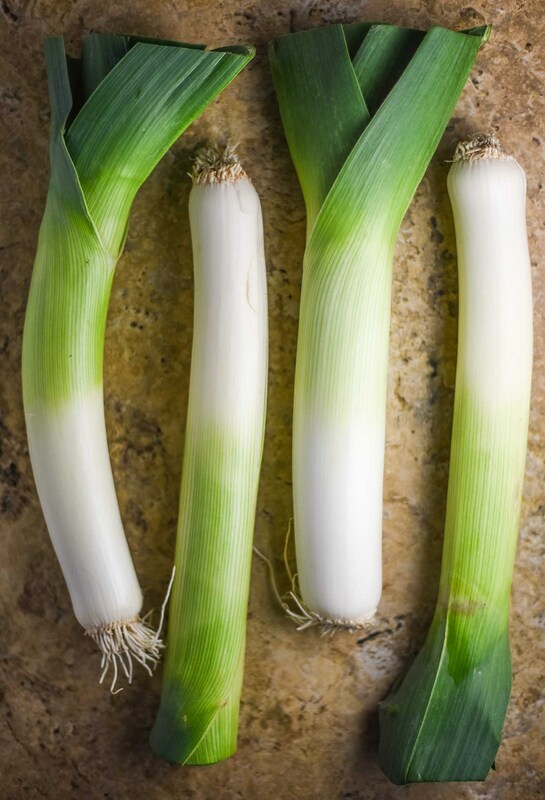 Simply chop leeks and potatoes and add them to your soup pot. Sauté for a few minutes, add the veggie broth and spices, and simmer for about 15 minutes. Using an immersion blender or Vitamix, blend until desired consistency is reached. I like my soup smooth with a few chunks of potato, so hold back some potatoes if you want some additional texture. This is a thick soup by nature, so don’t worry about it being too thin if you don’t go for the full blend. what should I pair with this vegan soup? So glad you asked! Definitely a crusty (in the good way), warm piece of bread and/or a fresh salad. My next go-to is a glass of white wine (see below for wine pairing suggestions). If you’re in the soup-making mood, try this vegan broccoli soup, mushroom lentil soup with kale, moroccan chickpea stew, vegan asparagus soup. 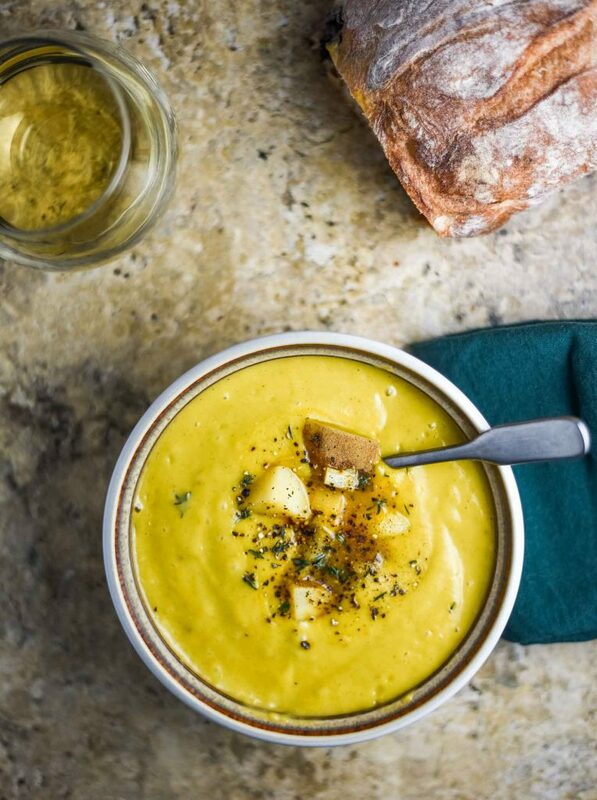 If you make this vegan potato leek soup, leave a comment, rate the recipe, and tag a photo with #plantandvine on Instagram. I’d love to hear about your soup adventures! Chablis: Unoaked Chardonnay from France. This pairing is all about crisp acidity, which provides a nice contrast to the creaminess of the potato base. White Rhône Blend: Made from Marsanne & Roussanne, this blend has a good balance between the full body and waxy texture of Marsanne and the bright acidity and fruit-forward aromatics of Roussanne. Viognier: Full-bodied white wine that originated in southern France, with aromatics of tangerine, peach, mango, and honeysuckle. If you want a creamier and fruitier white wine, Viognier is a good choice. 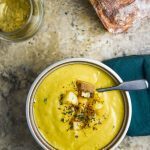 Creamy and delicious vegan potato leek soup that is perfect with a warm slice of crusty bread and a cold glass of white wine. Heat the oil, butter, and a hearty pinch of salt in a large pot over medium heat. Once warmed, add the leeks and onion. Sauté until softened and starting to turn translucent, about 5 minutes. Add the potatoes, garlic, thyme, rosemary, basil, and coriander. Sauté for 2-3 minutes until aromatic. Add the vegetable broth, bay leaves, salt, and pepper. Raise heat until it comes to a low boil. Reduce heat to a low simmer and cook for about 15-20 minutes, until the potatoes are tender when pierced with a fork. Remove from heat. Stir in the coconut milk and lemon juice. Season to taste – I added more salt and pepper, to bring out the flavors more. Before blending, set aside a few pieces of potato, if desired. Remove Bay Leaves. Using an immersion blender or Vitamix, blend until creamy. You can also use a regular blender and carefully blend in batches. To serve, add a few pieces of cooked potatoes and top with fresh cracked black pepper. Store in covered container in refrigerator up to 4 days. Flavors will continue to meld over time, so don’t feel like you need to eat it immediately. *Recipe is a guide. Adapt as desired. Inspired by Vegan Huggs’ delicious recipe.